For a relaxing holiday in a stunning lakeside setting!! Beautifully positioned fully furnished 3 bedroom house, 2 bathrooms, well equipped kitchen, laundry and lounge. Duvets/pillows & sheets provided for all beds. Towel hire available on request. Freeview TV. BBQ and chiminea in an outdoor enclosed area. Views overlooking the lake and up to the mountains. Ideal for a family holiday, summer or winter. 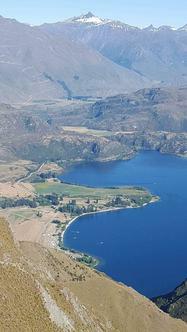 Just minutes from Treble Cone Ski Resort and close to the iconic Diamond Lake and Roys Peak walks. Closest camping ground to the Mt Aspiring National Park just 40 km away where you can walk up the beautiful Rob Roy Glacier valley. $350/night is for up to 10 guests. $20/night for extra guests. Room Bedding: 1 King Bed, 1 Queen bed, 1 Double bed, 3 single beds, 1 sets of single bunks & a rollaway bed. Our lodge sleeps 21 people. Two of the comfortable bunk-rooms sleep six people. Pillows and bottom sheets provided. Bring a sleeping bag Rooms are all heated. Lodge guests have the use of a well equipped kitchen, lounge and dining room. Free view TV & log burner fire with fire wood provided. A large deck faces out towards the lake, with a BBQ and picnic tables. Attached to the lodge is an ablution block with showers, toilets (showers $1 coins for 6 mins) and a disability/family bathroom. The lodge is ideal for all sorts of groups including skiing, climbing, fishing, boating or even family reunions. Ask about our hot tub in winter!! $65 for the whole evening. Brilliant for star gazing or just soaking in after a day on the snow. Single room with double bed and set of single bunks (Linen provided) Table and chairs, heating, kitchenette. Use communal showers ($1 coins) and toilets nearby. Single rooms sleeping between 1 and 3 guests with a double bunk and a single bed. Bottom sheet, pillow and pillow case provided. It is recommended that guests supply their own bedding, towels and cooking utensils. 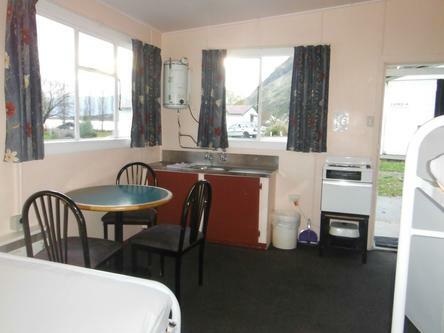 The communal kitchen and shower / toilet facilities are nearby. Spacious, grassy camp sites with power in a beautiful location Water taps are shared,one every 30 metres. Caravans plugging into our power boxes must have a current electrical warrant of fitness. Tents on powered sites must have an approved isolating transformer or residual current device with a 10m lead. If you enjoy camping, you'll love staying with us! There are many great spots at Glendhu Bay Motor Camp to set up your tent or park your motor home. Enjoy the spectacular views and wake up next to the beautiful Lake Wanaka.